Heat the chips in a sauce pan on medium heat; as they begin to melt, add condensed milk and mix well. 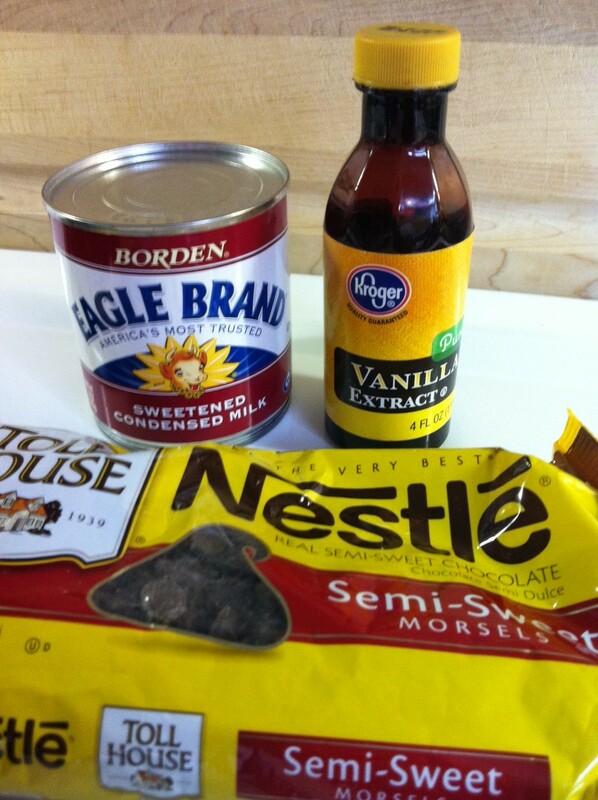 Once fully melted, remove from heat and add about a cap full of vanilla. Mix well. Then spread fudge onto a baking pan lined with aluminum foil. Shape into a large square and let harden in fridge for about half an hour. OR...before spreading fudge onto pan, add some other good stuff to it like walnuts, marshmallows and big Heath bar chunks. A-freaking-mazing! For my next batch, I plan to make the basic fudge recipe with Andes peppermint pieces sprinkled on top. Thank you to my co-worker Dee Dee who rocked my world when she introduced me to this recipe. For minimal ingredients and about 15 minutes of prep work, you get a delicious treat. So wrap it up in pretty cellophane, pop a bow on top and take it to your next holiday party for some serious bragging rights. BOOM DONE! Can't wait to taste these tonight! LOVE easy recipes this time of year and great idea to add in a few extra treats. YUM! OMG, this is perfect for a crazy, lazy person like me! And the add-in ideas are great too...no creativity required. Love. Thanks to Missy, I was able to sample this Friday night. Let me tell you Fudge + Heath Bar Chunks = Serious Bliss! I made this with the fat-free sweetened condensed milk and put crush candy canes on top - it is yummy!!! Nice work Kristi! Glad they turned out.